With a needle make a small hole at the top. Spray paint the pendant with metallic spray paint and when dry, seal it with the clear acrylic coating. **update** I found that the acrylic spray didn't give me the durability and protection I was looking for so for better results, use a clear gloss polyurethane (Varathane, gloss-indoor) to seal the pendant. Here is a zoomed in photo so you can see the detail of the fingerprint. WHAT a CUTE idea!!! I will definitely be doing this. have you tried using that clay that is already metallic? did it work? these are GREAT last minute mother's day gifts. :) thank you. thank you. You know what, I haven't tried the metallic colored clay but that is a good idea! If you happen to try it please let me know how it turns out. Cheers! Such a refreshing take on the big clay hand print plates or tacky laced up embroidery rings that I have to memorialize my childhood. I will definitely be taking this on for my (future) kids! Thanks for the idea! Wow! I found you via Plushka's Craft and am now following your blog! 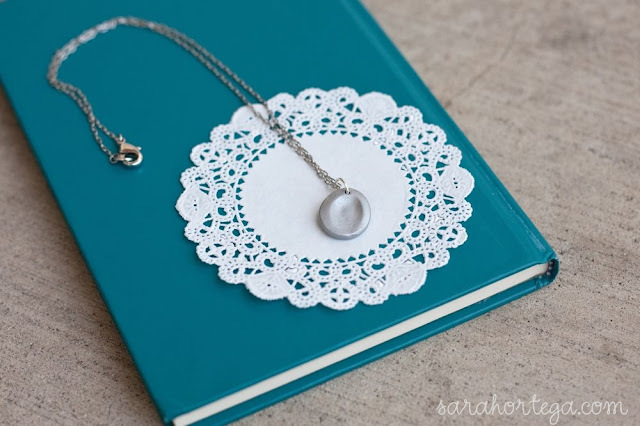 This necklace is delightful! I will definitely be doing one with my 9 month old! Just wanted you to know I love this project- and featured you this week on A Law Student's Journey! THIS IS GENIUS!! Oh my gosh, I love it. I saw this on Pinterest and I'm so glad I clicked through. I love it times a million. I have been wanting these http://www.imprintonmyheart.com/ for years but they are so expensive! 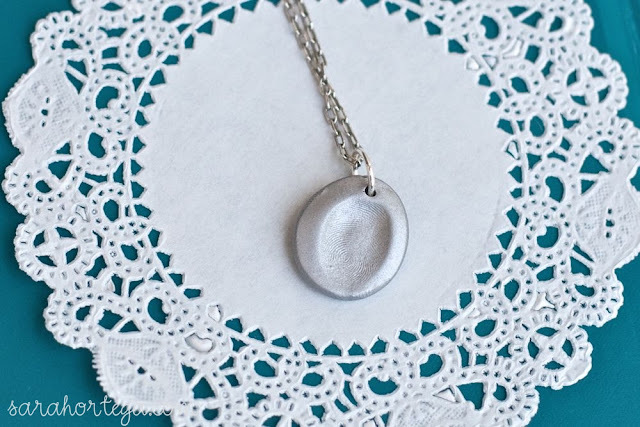 The kids and I will be making your necklace this weekend for their dad for fathers day :) I'm going to try the metallic clay. I'll let you know how they turn out. I was thinking of making these for the kids I babysit, but... How much do you think these would sell for, if anything? Mia, I think this would be hard to sell unless you set up a shop, had people pay in advance, do the fingerprint and either pick them up once complete or mail to their address. Most people won't buy a random fingerprint, no matter how cute. I'm going to do this for my 3 mo old's fingerprint...and maybe get a group of my mommy friends together too. I love it! How do they hold up? Can you wear them in the shower??? These are great! My MIL had one made for my husband after his dad passed away. I liked the idea for a child more, but like you said - they are a bit pricey. I think I might give these a try with my kids. I like how you use everyday tools - ie, the pen for a rolling pin. It makes it much more "approachable". I think will do this as a christmas great for my mom off my daughters fingerprint and add the jewel and maybe even mod podge a picture of my daughter on the back before I clear coat it! Thanks for a great idea!! Love this. Would also be cute to stamp the finger print into the indention before clear coating it. My Son and Girlfriend just had a baby girl, I could easily get baby's fingerprint on some metallic clay (I thought that would be best) at my next babysitting gig! I wanted to try this idea and bought the metallic colored clay. It had a bit of a sheen to it that took away from the fingerprint; you could barely see the fingerprint even close up. 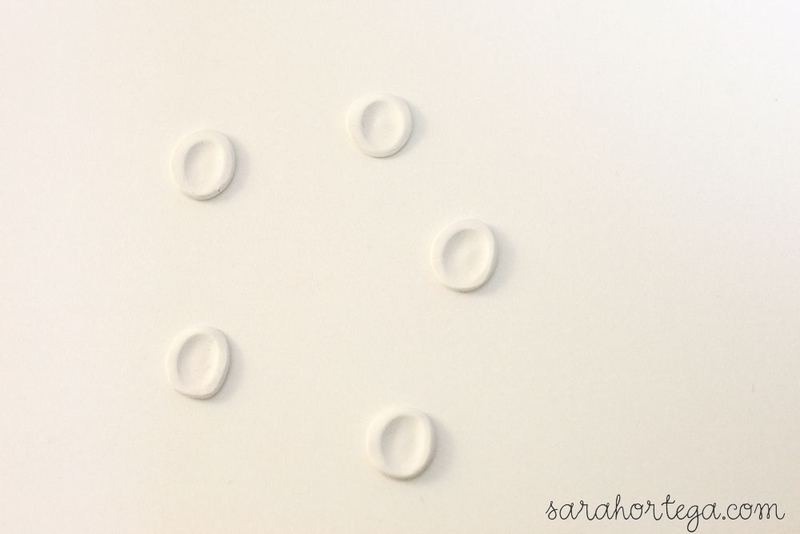 I went back and bought white clay and used my own finger prints since I had no small children on hand! Even with the pressure I put on the clay, you can barely see the print. Is there something I'm doing wrong? I haven't painted the white ones yet, maybe after I paint them the print will show up a bit more? My next step is just to take regular paint/ink and make a print. Any advice would be most helpful! Love the idea, just haven't been as successful! What an awesome idea! Thanks So creative! I will be doing this for many Christmas presents this year...most of them will be ornaments instead of necklaces! Can I just tell you that I felt the same sticker shock when I came across them. I never thought to use clay! So genius! I will definitely be adding these to my last minute Christmas gifts for grandparents. Thanks for providing this! @Susan Susan, I used the white clay and couldn't see the print, but once it was painted, it was very obvious. It turned out beautifully! I made these last week and they turned out great with only one problem. I sprayed the pendant with a silver paint, it has been 4 days and the paint is still wet! Did you spray the clear coat before the silver dried or am I doing something wrong? Regardless, thanks for the amazing tutorial! You are awesome!!!! Just found this via pinterest and I am addicted! I've made this two ways now, once w/metallic clay (for myself) and once w/white clay & spray painted (for my students). Both turn out cute, but the fingerprint is easier to see in the white clay w/spraypaint. I can't wait to make this! My boyfriend is going overseas for the military soon and I'm going to make him one of my print and his sons. Thank you so much for the idea! SO CUTE! 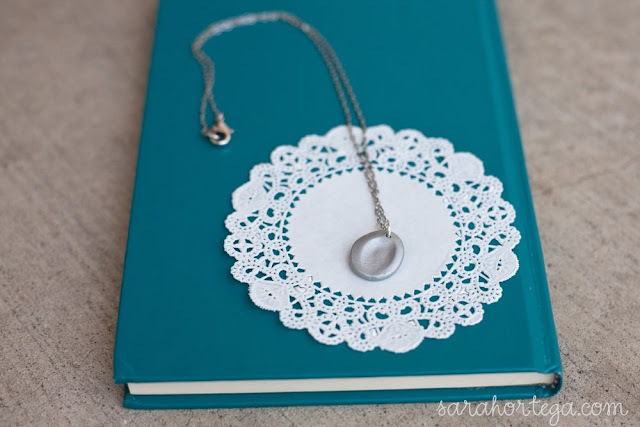 I am going to have to make this, but I think you would just be able to use silver clay too. I tried to reply to individual comments, but it wouldn't work. Susan, you wrote on Nov 6, 2011 that your fingerprints didn't show up very well. I don't know how old you are, but I had to have fingerprints taken for a teaching job once. The police officer told me that as we age our fingerprints become smoother, although they never go away. Children's prints should make a deeper impression. Courtney, you posted on Dec 25, 2011. The chemicals that are used to make spray paints and clear coats almost always will cause a problem with polymer clay. Sometimes it seems to work at first, but as time goes on, the clay will get sticky. Seems like yours got sticky right away. Does anybody know if the metallic clay stuff worked?? on one website for the metal fingerprint charms, it says that for children under 9 months since the fingerprints are very fine until about then. most likely there are some folks who have done this with younger children and been successful, but just in case you haven't be successful it may be that you need to wait until the child is older. these other websites suggest a toe print instead as well. so that is their take on. very clever way to do this. thanks for sharing. I can't even begin to tell you how completely excited I am about this. I feel like a kid in a candy store! Between this tutorial and the birds nest necklace tutorial, I can't help myself!!! I won't be able to sleep tonight! I tried this and they came out great... Until I sprayed in the polyurethane. They've been sticky for two days now! Help!! The silver metallic spray paint (the dull/matte one not the shiniest one) made my boys' fingerprints pop! But I had a problem once I applied the polyurethane. It made the silver paint wash off. I am hoping that once it dries I can paint over it and see how to proceed from there. It sure looked nice before the polyurethane! If worse comes to worse, I will just do it again and stop before the gloss step and let the grandmas know to take it off before showering and such. Just wanted to drop an idea here. 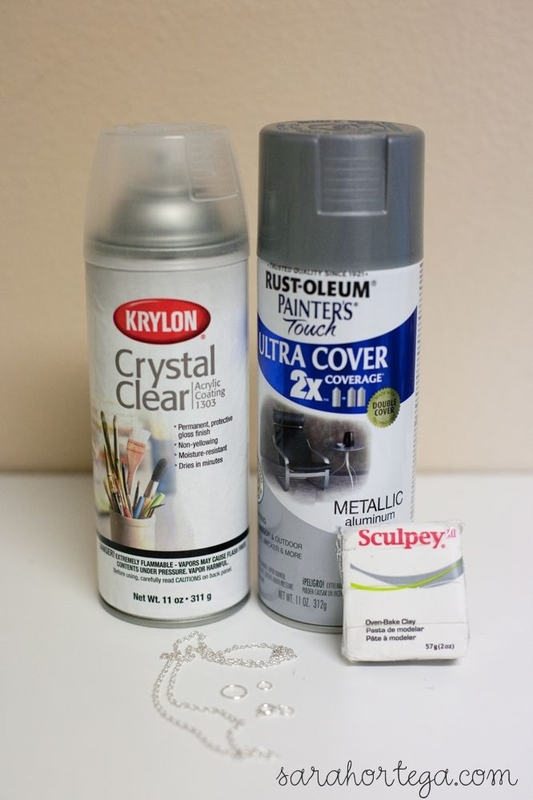 If the spray paint is giving you issues you may want to try using a metallic silver acrylic paint and hand painting them. 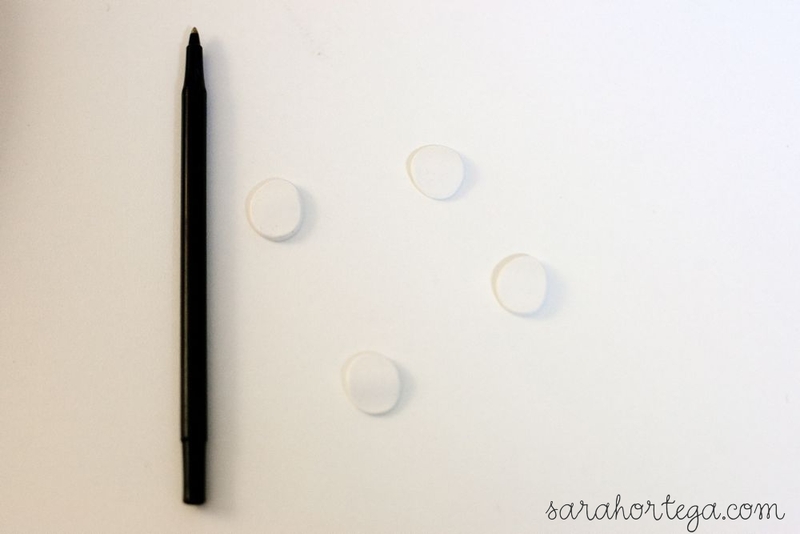 Acrylic paint is great for polymer clay. Also just about any sealant that says its for acrylic paint should seal well. Going to give this a shot this weekend with my three little ones! Can't wait. Thanks so much for the project! 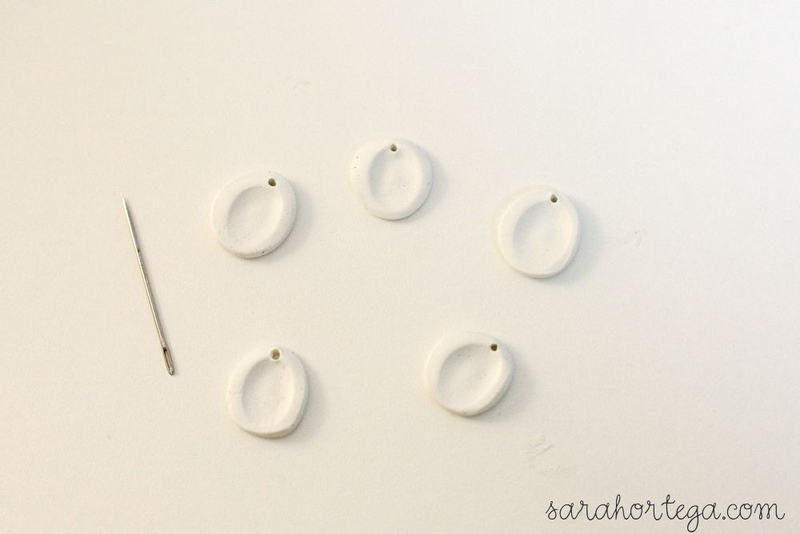 I have been wanting to try this, but instead of using oven bake clay, I was going to use a resin clay that already looks metallic - have you ever worked with those? I am waiting on my order of Klay Resin to get here - to try it out, but this is exactly the process I was going to use. Thanks for sharing! I haven't worked with those but I would be very interested to hear how it goes for you. Let me know how it turns out. To be honest, I rarely comment on all of the great ideas I find but I just had to tell you how much I love this idea. I have a daycare and I've done a ton of hand print crafts with the kids for any and all holidays. This is so unique and personal, I can't wait for the next chance to do this with my kiddos. It's so adaptable for any age child (even my babies). I love this. Thank you!!! I've been trying to do this but my kids fingerprints never come out, they just look like a pressed-in area, no real line markings. Is there a trick to get clear prints? Don't know if it's the clay I'm using. This is all great in theory. Until you go buy all the stuff and you realize your three year old nephew doesn't have fingerprints that are pronounced enough to make one yet. Lol. Maybe this would work better; make the indentation in the clay with the back of a small spoon. Bake as usual. Paint with the silver spray paint. Then lay the child's finger on a black stamp pad (like the do in the hospital when they are newborns), lay their wet finger on the baked clay in the indentation. Then when the finger print ink dries, spray on the acrylic protective coating. This may work best & the finger print would be more pronounced. You are amazingly creative. I gotta love your work! We're doing this today. Perfect for a rainy afternoon! Thanks! You are so creative, very nice tutorial. I'm gonna try this on a rainy day, thanks!! Yes!! I have found a diy gift for my daughters grandparents! Doing this asap! I really love this! I took my grandson's thumbprint and painted some gold and some silver then glued them to flattened bottle caps. Some were put on black bead cord necklaces for his aunts, some on gold chain necklaces with charms to dress them up for the grandma and his mom. For grandpa and dad, I used them on a carabiner ring for a key ring. Everyone thought they were very cool. I used your idea to make a version where I mounted the clay thumbprints on flattened bottle caps. I made them with bead cord for my grandson's aunts, antique gold chain and charms for his other grandma and my daughter, and carabiner clips for his dad and grandpa. Everyone thought they were really neat and unique. Thanks for sparking that idea! Another idea that you can do to make the print really stand out is after the silver spray paint dries, brush the clay piece with black paint and then immediately wipe it off with a damp paper towel. After it dries then you can coat it with the poly. This will give it an antique finish. I always like to do that when working with clay and salt dough. Thank you for sharing. These pendant necklace are so adorable, so cute. I'd like to make a letter necklace for myself. I made these charms off my niece's fingerprint for her dad, my brother for Christmas. We glued it into a leather fob to make a key chain out of it. I used silver metallic clay. The fingerprint did not show up much, though she is 11, so I tried rubbing stamp I'll in grooves, not much success, then got some black craft paint and dabbled it into grooves wiping of excess. This looked better. To preserve, I coated it with clear nail polish. Turned out great!